Thunder is the lead stallion of the pinto herd and has been on the coast for his whole life. We are not sure his age but the best guest is he is over 20. In the above photo he is standing on the bluff above Highway 1 looking very regal where he is admired by people when they drive by. When I first met him he had a pretty bad reputation as the fence on the property he was living on was down. He would get into trouble wandering around the neighborhood. However things have changed for him and so he has changed! He now lives on a totally fenced in property, gets extra food regularly and does not have such a large herd to be responsible for anymore. He is much calmer and very happy. He has adjusted to humans, although we cannot touch him, we can hand feed him carrots. I absolutely adore him and he has so much love in his eyes when we are with him. He is too old to be gelded so he would die. He still produces babies with the two mares that live with him. If we took the mares away and brought them next door to our property, he would break the fence down to get to them. Horse instinct to breed is very strong, so in this case we must let nature takes its course. 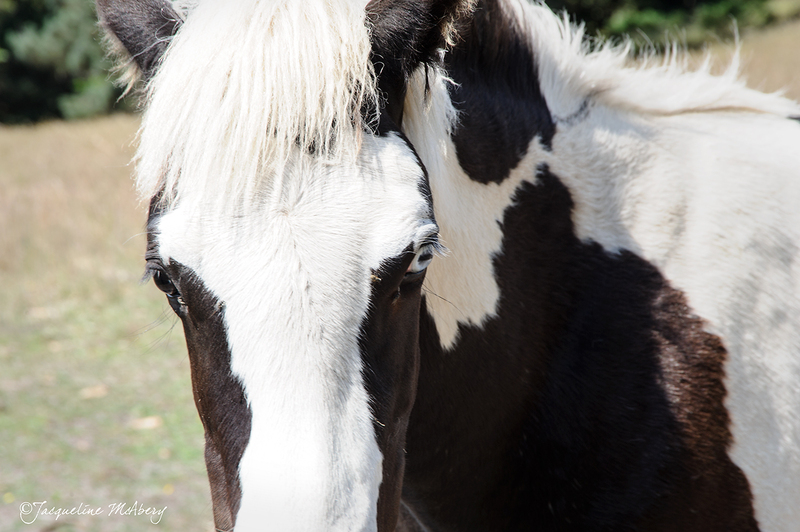 His herd is smaller because we have the other stallions from the original herd, now geldings, living on our side of the fence. 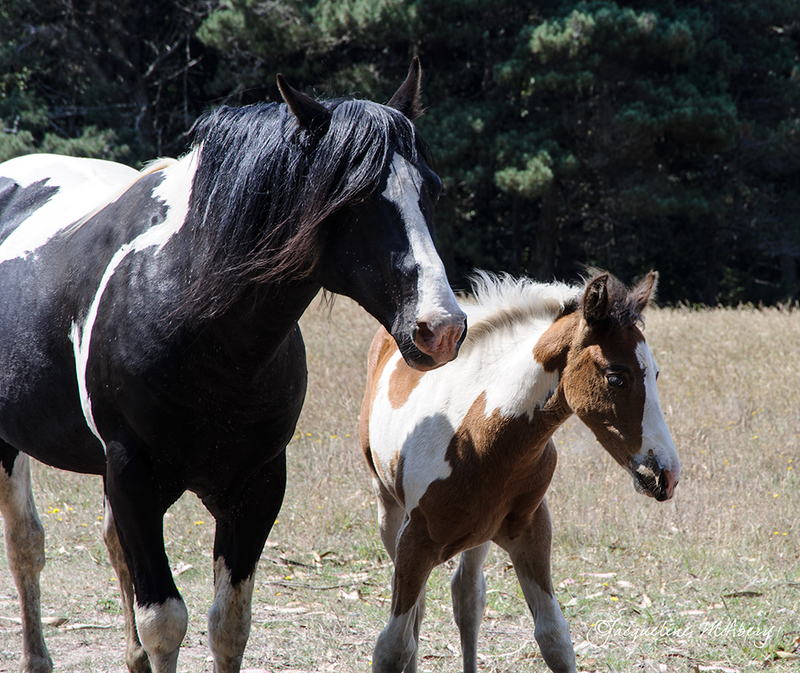 When the new colts and fillies are a year old we also bring them over here and the colts are gelded at the appropriate age so they cannot breed. Majestic is 6 weeks old in these photos. 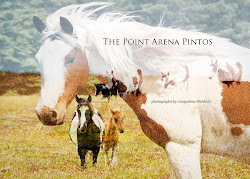 Several of the pintos have one blue eye. 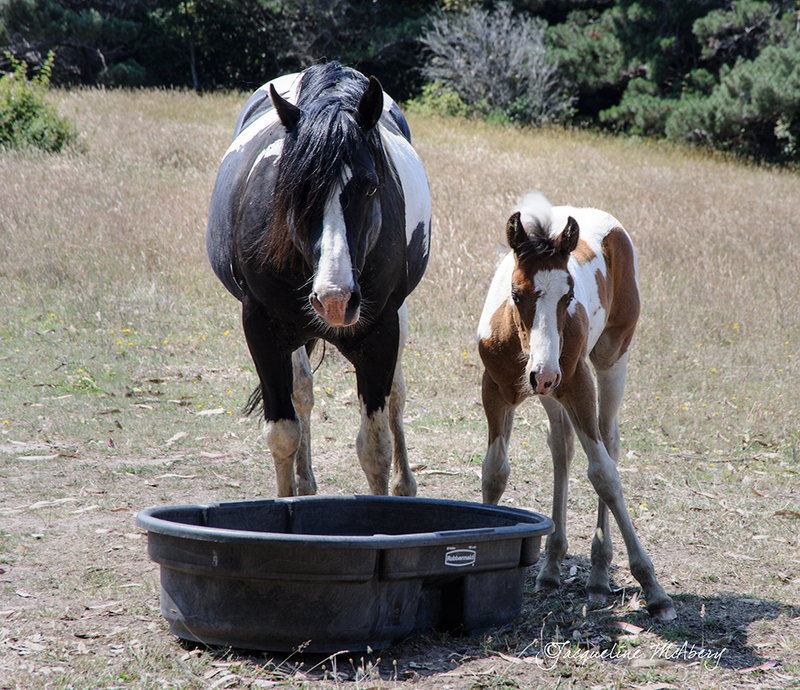 The two breeding mares, Polka Dot, and Mama,as well as Little One, Majestic and Otumwa, pictured above, have one blue eye. 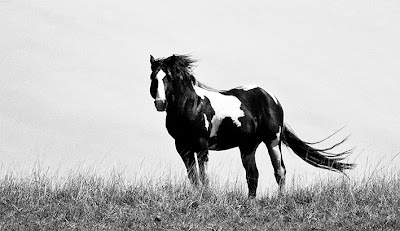 A wonderful friend to the pintos said he thought Otumwa with her thick white mane looks like a punk rock star! Don't you agree?! 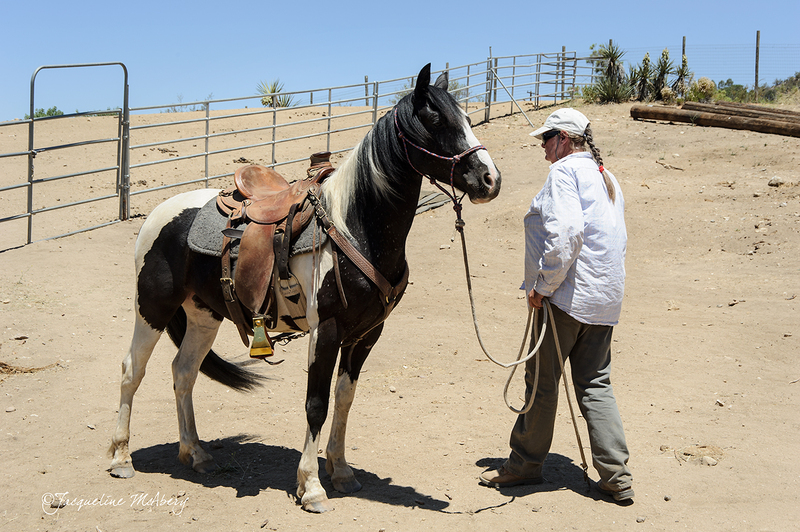 Suki and Sweetie are down in Anza with their trainer Kathe Smothers being trained to be riding horses. Sally Campbell, another wonderful friend to the pintos, and I went down to see them last week in the heat wave. Hot!! So we were not able to do much work with the horses but it was wonderful to see them and Kathe's ranch. They have learned to stand still when tied to a fence or post and love to get hosed down! He looks very handsome! 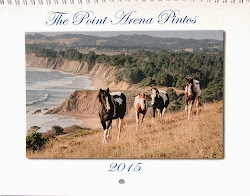 We look forward to their return to the Pinto Ranch at the end of the month. Kathe will be doing a two day horsemanship clinic here on the coast Saturday and Sunday August 3rd and 4th. Call Molly at 707 884-1329 or Kathe at 805 798-0234 for more information.